This entry was posted on July 18, 2014 by Matt Wilson.  Sennheiser, well known for their high-end audio equipment, are also key players in the business market with their computer and telephone headsets and speakerphones.The Sennheiser SP20 Speakerphones are well designed, easy to use portable speakerphones that can be used by both business professionals and for personal use. Built to Sennheiser’s high quality standards, the Sennheiser SP20 offers an array of Sennheiser’s impressive audio features and the hardware buttons on the top of the speakerphone provide a satisfying click when pressed. The stylish black and silver design is classy and yet still boasts a state-of-the-art attractiveness. Portability and ease of use is what Sennheiser have aimed for here, the SP 20 has “plug in and play” functionality and is small enough to fit in your pocket; the robust construction and strong metal grill of the SP range prepares it for everyday knocks and bumps. To have a portable speakerphone constantly plugged in and used in one place would be missing the point. With a talk time of 20 hours and a charge time of only 2 and a half hours the Sennheiser SP20 supports a lengthy battery life. Battery life is displayed via a LED indicator on the top of the Speakerphone and if you are caught short there are voice prompts to make you aware your time is running out, so in effect you should never be cut off though lack of power. The differences between the SP 10 and SP 20 are simple; the SP 10 supports calls via PC – softphone through a USB connection while the Sennheiser SP20 brings mobile phones and tablets into the mix with both USB and 3.5mm audio wrap around cable system. To share a phone call with a group of people in a small meeting or office room you would only need to unwind the 3.5mm audio cable and vice versa if you’re using Skype for Business on your computer, the USB cable will serve the purpose. Interacting and handling the SP 20 couldn’t be simpler with call features including full volume control with LEDs, answer, end and microphone mute. Sennheiser’s Dual Talk allows conversation to be interrupted more naturally, Voice Clarity and Echo Cancellation technology removes unwanted sound reflections to provide the highest communication experience and a 360 degree microphone pickup ensures everyone participating can have their say. For those quieter moments, the Sennheiser SP20 speakerphone doubles as a mono speaker that you can play your favourite songs through. Although, don’t expect this feature to be the floor-filler as the volume output is low and the lack of bass is distinct. 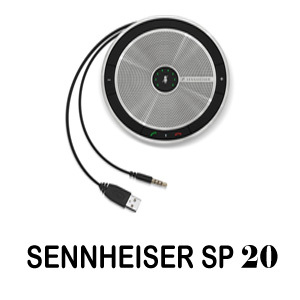 Overall the Sennheiser SP 20 provides a flexible speakerphone solution for users wanting a sophisticated design and user friendly functionality. It’s an excellent solution to replace laptop speakers and microphone and will make a clear style statement in any office.